Serving as an AmeriCorps member with Reading Partners has shown me how important it is to be active in education. It is more than just helping people; it’s about caring and giving a voice to those who are not heard. AmeriCorps members get things done, and are critical to our success as an organization. Be it leading the day-to-day operations of our reading centers, recruiting volunteers, or coaching volunteer tutors, our members make an impact on the students we serve. What can I do as an AmeriCorps member? 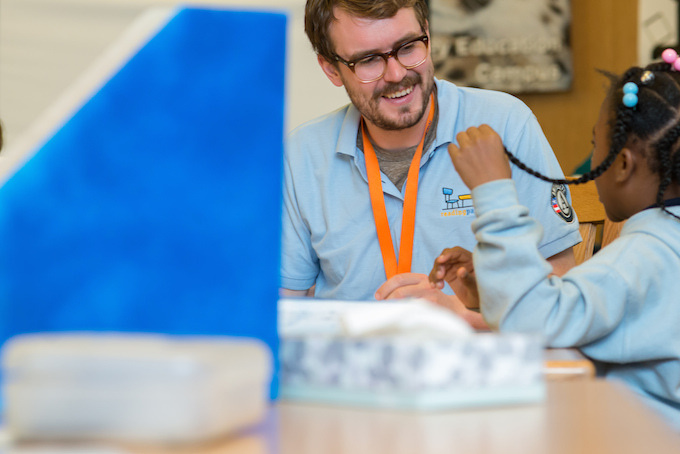 Members serve directly in a partner school site or within a region for an 11-month term. Because we work with elementary schools, our AmeriCorps opportunities run from August – June each year. School based programming – interested in tutoring students and coaching volunteers? Community engagement – interested in volunteer recruiting and engagement? What can I do as a VISTA member? Our VISTA members have the chance to serve on our national team or regional teams. VISTAs focus on creating sustainable and capacity-building projects, like grant writing, communications, or program operations. Reading Partners will be recruiting VISTA members to begin service in August and November of 2019. For more information about the VISTA program in general, visit the Corporation for National and Community Service website. As an AmeriCorps member with Reading Partners, you’re both part of a national service movement and a growing educational nonprofit—which means you’ve got access to some great benefits. We offer a competitive stipend, health benefits, and ongoing professional development. Check out our full list of benefits & need-to-know info. How can I learn more about the Reading Partners AmeriCorps experience? Read our blog for firsthand accounts of what it’s like to serve and what opportunities arise after service. Still have questions? Contact us at americorps@readingpartners.org!